There were two dirt track variants to my main route that I had planned to do for the day before, but it had been such a long day that I had not had time to do the second one, another long arch to the north of Vielha starting in the village of Baguerge. The previous evening I had been planning the route and I thought I had time today, but the day was grey and the clouds threatened with rain, so I was not so sure about it. 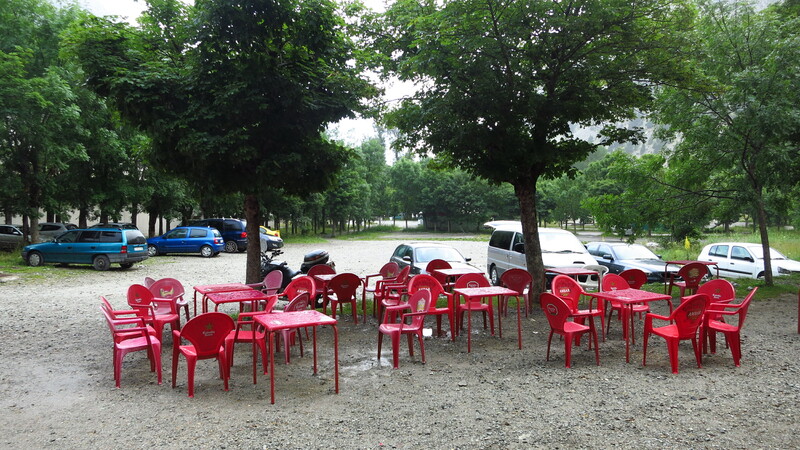 I had breakfast in the terrace and as I was getting everything packed and ready on the bike, a light drizzle started to fall. I did not want to get out the rain suit, firstly because I was too lazy, and secondly because according to the weather service there was no rain on the other side of the tunnel, which is where I was headed. 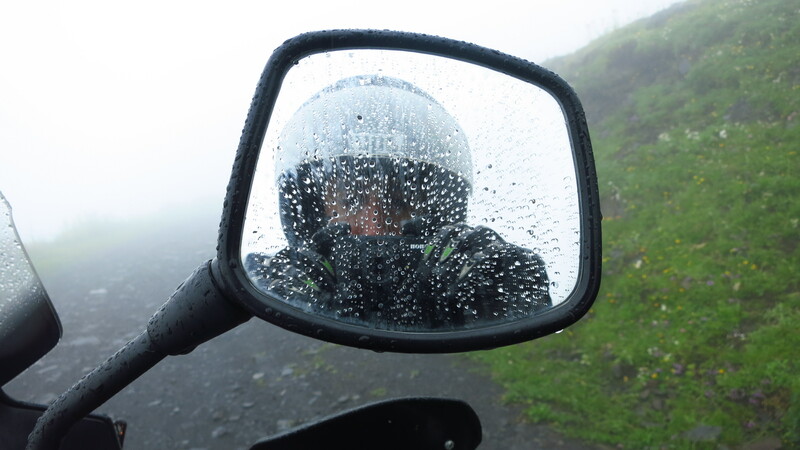 I got on the bike and rode fast towards the entrance of the tunnel, as the drizzle turned into more serious rain. On the other side there was no rain but it was still cloudy, so it was time to make a decision. Turn right and go back a few kilometers the way I had come the day before to take the dirt road and risk a downpour turning the track to nasty mud in the middle of nowhere, or turn left and go on with the rest of the route planned for that day, all on tarmac? I had had great fun in the dirt the day before, and I wanted more. Unlike the tracks I had not found at the beginning of the journey, this area was further away from home, so I would not come back here some other day just to do that bit. On the other hand, I did not fancy having to deal with technical riding in the mud with a heavy bike, all by myself. ‘Man up, Kilian!’ I told myself. ‘You’ve got a beard, and a beard is not just something that grows on your face, you have to earn it!’ So as you can see, I made the sensible decision and headed for the dirt track. 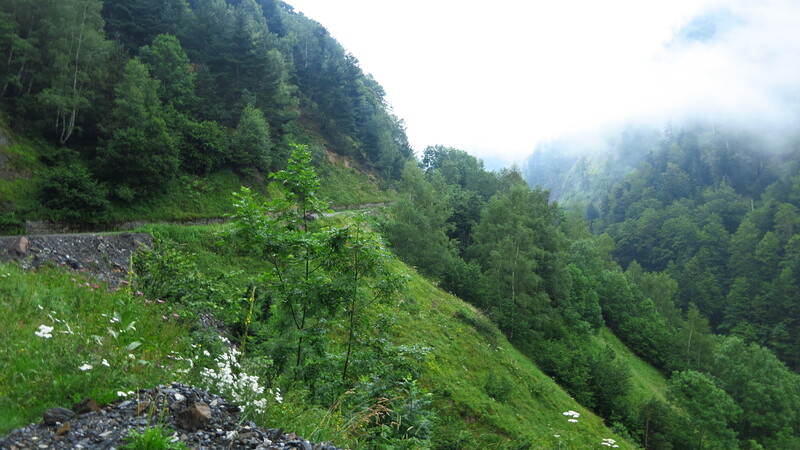 By the time I reached Baguergue, the village where the tarmac ended, it was damp foggy higher up in the mountain, but there was no rain yet. 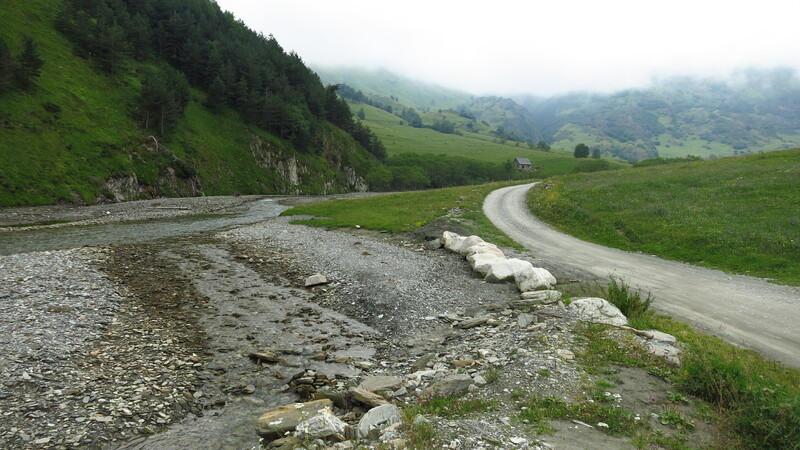 I rode across the village and found a very good unpaved road along the right bank of a river. Past some farmhouses, a small bridge cut across the river and the road turned narrower, steeper, and rocky as it started climbing closer and closer to the fog in a series of tight hairpins, and I had to stand on the bike to negotiate some trickier sections. There was a lot of water coming down the mountain in streams and small waterfalls, and I had to ride across several parts where the streams flowed across the road. 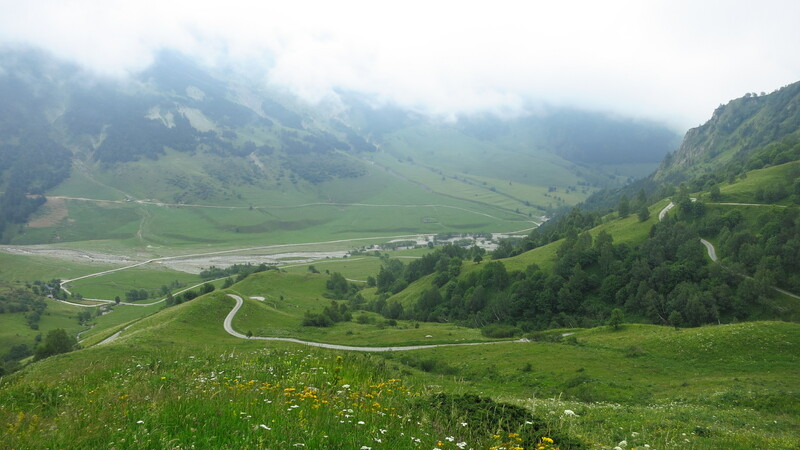 The steep climb turned to a gentle incline that disappeared into the fog further ahead, and I stopped to have one last look behind me – from where I was standing I had a stunning view of the lush green valley below. It had been well worth coming this way. 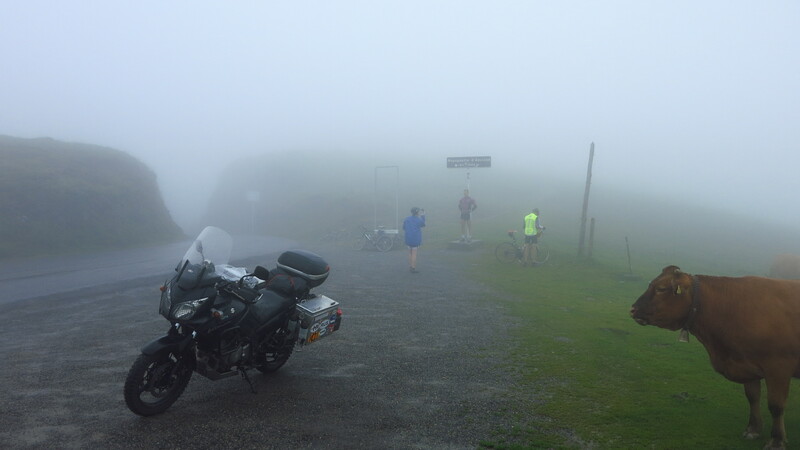 I rode on, and what had been light fog turned thicker and thicker in a matter of minutes, and soon I had completely lost sight of the valley below and the pass ahead. Then a few drops of rain started to fall, and seeing that the weather was definitely not going to improve this time, I looked for a place to stop by the road to take out the rain suit. As I did, it started to pour down, and while I was struggling to get on the suit, there was a flash of light and a deafening thunder. A bolt of lightning had struck somewhere in the fog, and judging from the delay between lightning and thunder, which was virtually non-existent, I guessed it must have been really damn close. I had no idea how far from the top I was, but I feared I was probably there already, and then I realized that I was wet and standing next to over 200kg of the only metallic thing up there. I had never put on the rain suit so fast in my life and I swear that record is going to stick for a long time. I jumped on the bike and got the hell out of there hoping that the road down was not far ahead. By now the track was soaking wet, but fortunately it was quite rocky, not the mud I had been fearing, and to my immense relief, the road started to go down almost immediately. I did hear some more thunder, but it did not sound anywhere near as close as the first one, so I imagined the storm was on the other side of the mountain. 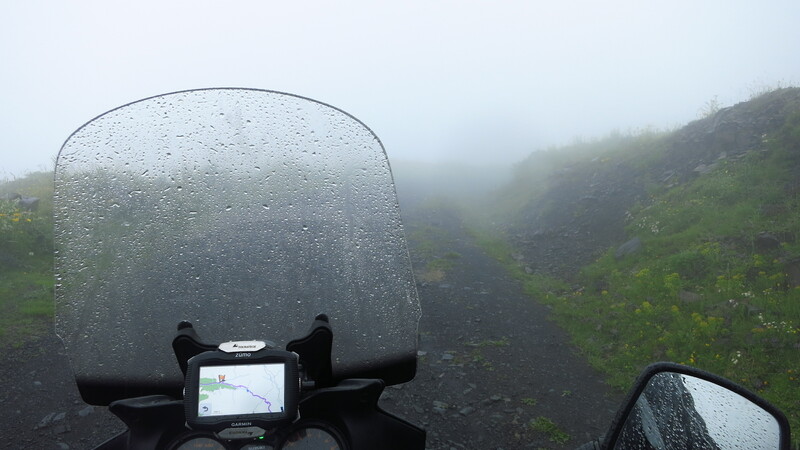 On this side my problem now was fog – it had turned so thick that I could only see a few meters ahead of me, so I had to slow down to almost a crawl. 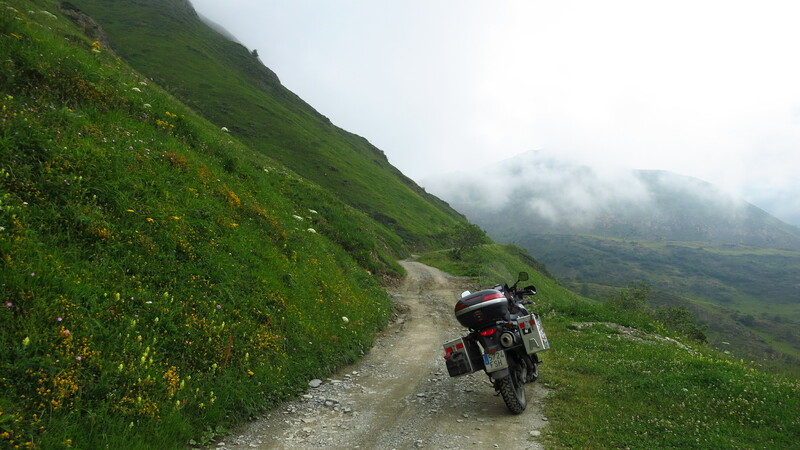 Back on the main road, I only did a few kilometers before turning left to exit Catalonia to the west via the Col du Portillon, the first of a series of legendary passes on the French side of the Pyrenees. The rain had stopped, and even though it was still a bit cloudy I took the rain suit off, but the fog was still there, sometime thinner sometimes thicker, but always enough for the sun to be completely hidden and for me to have no idea whether I was facing north, south, east or west. It is really a shame, for even though I really enjoyed the roads themselves from this point on, I can not say the same about the views. From the Col du Portillon the route continued through the Col de Peyresourde and down to Arreau, but instead of going all the way there, I cut through some backroads between Bordères-Louron and Ancizan, as I wanted to take the D113 and ride up the Hourquette d’Ancizan rather than the Col d’Aspin. 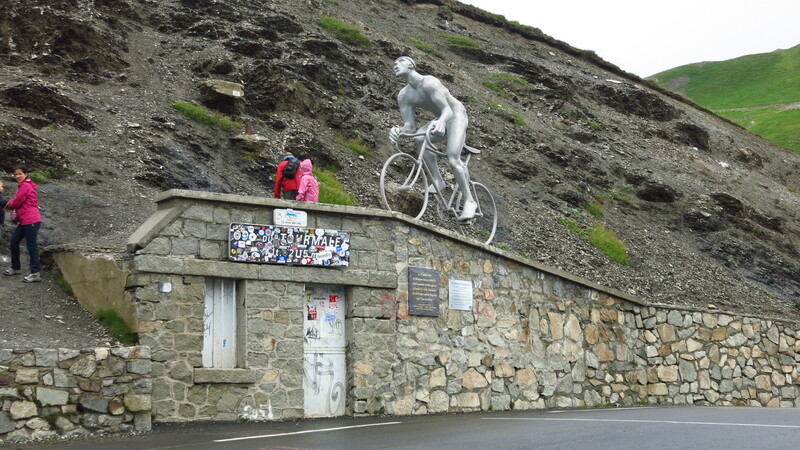 When I reached the top I found a couple of brave cyclists emulating their Tour de France idols and a cow and the optimist in me thought that if I could not enjoy the views, at least the bad weather had kept most cyclists at home, allowing me to enjoy the road. I took a picture of them, the cow, and my bike (no pedals on that one). Down to the valley again, and the fog finally cleared, even though the clouds did not. 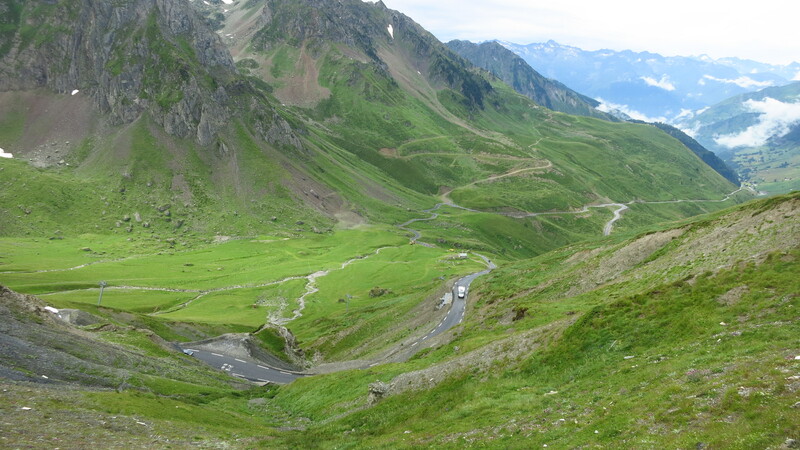 At least that would give me the chance to admire the views from the top of THE pass – the Col du Tourmalet. 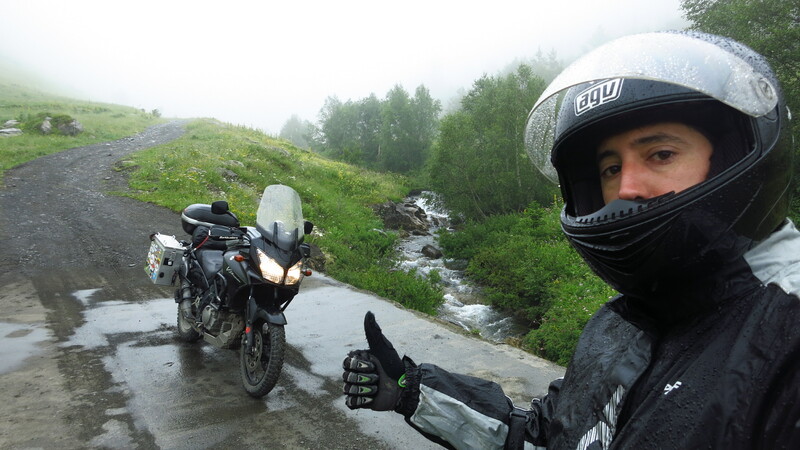 I had a blast on the way down to Luz-Saint-Sauveur, which was a very beautiful town, and up north into the Gorge de Luz (I had got my bearings now and I knew I was going north). Some kilometers later, the road took a turning west again in Argelès-Gazost and just as it happened with the Stelvio, which in my own humble opinion lost its “Best Road in the Wooooorld” crown to the Transfagarasan, what awaited ahead was going to steal the Tourmalet’s crown as my favorite mountain pass in this area – the combination Col du Soulor/Col d’Aubisque. 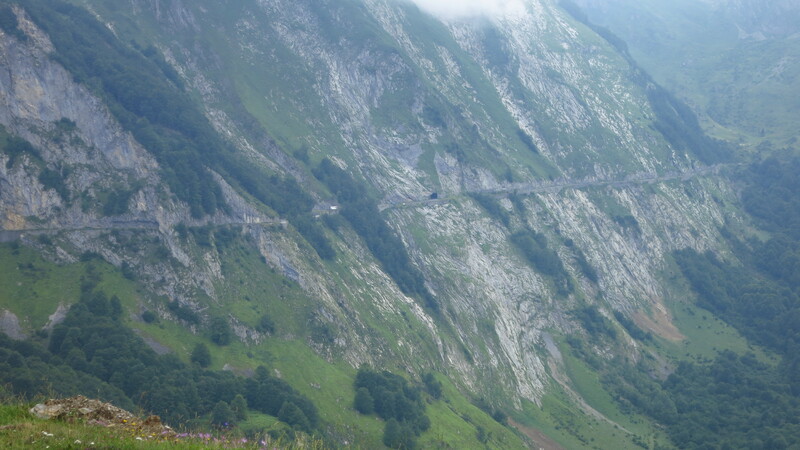 The road on the other side of the pass was just as spectacular as the way up – a few corners leading to narrow line cut in a near vertical wall. Amazing. The last big town I rode through on the French side was Laruns, and from there I followed the stunning Vallée d’Osseau up to the Col de Portalet, where I stopped to decided what to do for the rest of the day. It was still cloudy, so I could not see the Midi d’Osseau, a spectacular peak that my father took me and my sister to when we were kids. Happy memories! 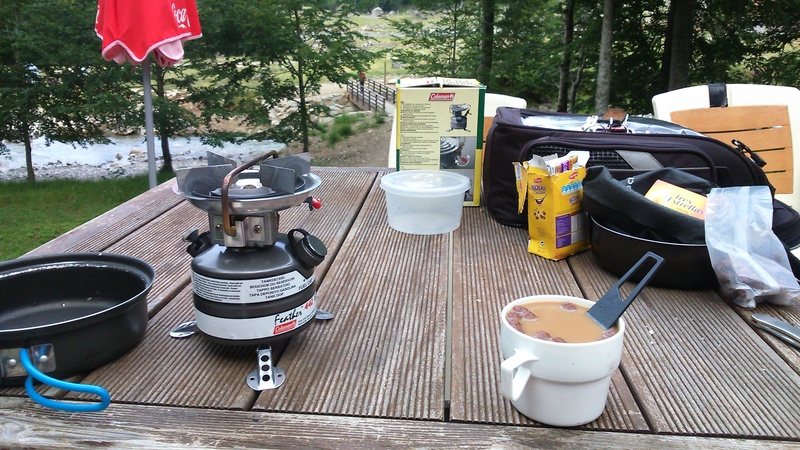 It was not very late, but I was cold and the weather on the Spanish side of the border looked worse, so I decided to call it a day and spend the night in another mountain hut instead of a campsite. There was a very nice one at the end of a beautiful gorge not far down the valley called Casa de Piedra, so I headed there and booked a bed and for the first time since I started, a full meal for dinner. 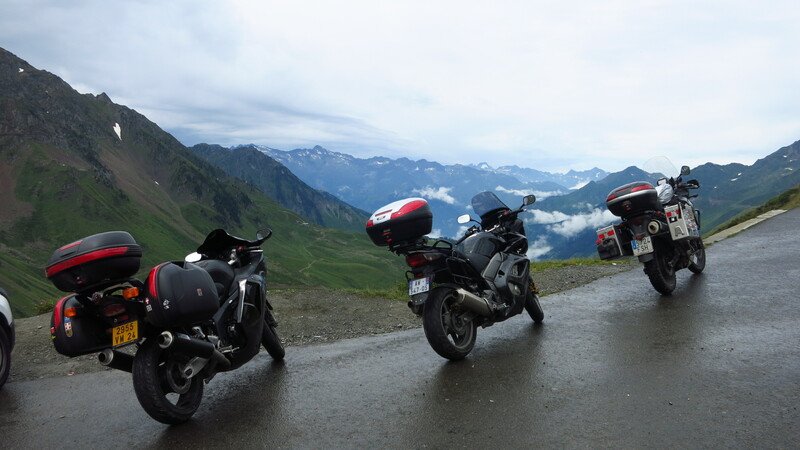 This entry was posted in Trans Pyrenees 2014, Travel and tagged Col d’Aubisque, Col de Peyresourde, Col de Portalet, Col du Portillon, Col du Soulor, Col du Tourmalet, Hourquette d’Ancizan, Refugi de Conangles by Kilian. Bookmark the permalink.